Does moving homes mean changing schools? Children in low-income communities often change schools and move residences. Using data from a panel study of households in 10 cities participating in Making Connections, the Annie E. Casey Foundation’s national place-based initiative, our new research reveals how residential moves connect to school changes within distressed neighborhoods. In the low-income communities studied, students often switch schools. Over three years, 78 percent of children changed schools. While 56 percent of those children switched from a lower to higher educational level like elementary school to junior high (a promotional change), 22 percent changed within their same level (a nonpromotional change). The remaining 22 percent remained at the same school in both periods. Thus, half of the children who could have stayed at their original school switched. Although less prevalent, housing moves were also common among low-income children. Approximately 55 percent of the children moved homes over the three years, far above the national rate. Switching schools in these neighborhoods was linked with residential mobility—although not as tightly as might be commonly understood. 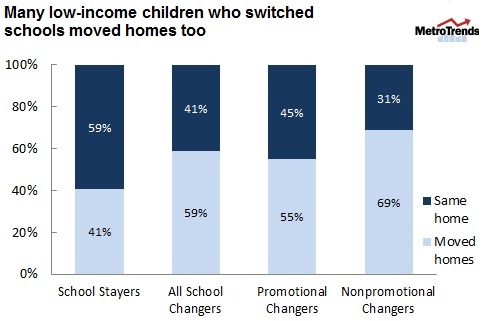 While the “school changers” moved homes more often than the “school stayers” (59 percent vs. 41 percent), both moves also occurred independently for many children and households. Moving homes was the highest for kids that switched schools within their educational level, but even for this group, 31 percent of children who made nonpromotional school changes did so without making a residential move. And looking at school stayers, we see that even 41 percent of these children moved homes. White children switched schools less than black or Hispanic children. Children in owner-occupied homes switched less than those in rented homes. Household income was not higher or lower on average for school stayers or changers. Kids with parents who received safety net programs such as SNAP and public housing were more likely to change schools. Parents’ educational attainment was not linked with whether their children switched schools. Kids with parents reporting greater satisfaction in their schools were more likely to stay. These patterns of residential and school mobility collectively add up to neighborhoods and schools that are fluid, not static, in nature. But are policy and practice set up to accommodate this flux? Stay tuned for tomorrow’s post on whether school switches actually helped kids reach higher-performing schools, and if so, under what conditions. In a third post, I’ll explore how place-based programs like Promise Neighborhoods should grapple with the mobility issue. This post is the first in a series that showed results from our new study of 10 communities participating in a place-based initiative, Making Connections. The second showed that while many kids switched schools over the course of the study, on average, children didn’t reach higher-ranked schools. The third explains how reducing unproductive school and residential churning may be a key to place-based investment success.